A computer program containing 20 printable Bingo Cards that feature 24 animals common to Florida. Through your computer you can play the animal calls and your students will cover the appropriate square. Included with each animal call are 5 facts to help students match the call to the animals. Computer requirements: Windows 95 or later, speakers, Internet Explorer 5.0 or later. 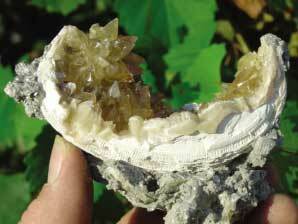 Actually this amazing geological formation is called a dogtooth spar calcite clam geode by mineralogists and rock collectors alike. These formations are both rare and unique here in Florida and involve three major steps that took over 100,000 years to form. Information on the processes involved in the formation of these dogtooth spar calcite clams. A computer program with tiles to the first 100 elements on the Periodic Table. Just print the tiles found on the CD and you are ready to go. Create your own rules or follow those on the CD and you have a great review for the elements of the periodic table.